There’s one big caveat, sadly: a massive majority of adults have no clue about what Roe v. Wade does. That includes Gallup itself, an otherwise credible organization! What did Roe v. Wade and Doe v. Bolton do? Those two Supreme Court cases legalized abortion through all nine months of pregnancy, for any reason. If you find an abortionist who will do one, and will say it’s for a “health” reason, no legal authority or court in America can stop it. Women’s Life in Danger: 4% – Michigan law has never made it illegal to end a pregnancy in the rare case where it’s a choice between mother or child (both have an equal right to life). In the Guttmacher study, the response is, “physical problems with my health.” That could range from concerns of age or past c-sections to true threats against a mother’s life. So, the 4% number is extremely generous. Child with life-threatening illness/disabled/Down syndrome: 3% – The Guttmacher study response is, “physical problems affecting the health of the fetus.” This could range from true life-threatening conditions, to Down syndrome, to a cleft palate easily correctable by surgery. So, even an extremely generous reading of reasons shows more than 92% of abortions are simply because the woman doesn’t want the child. 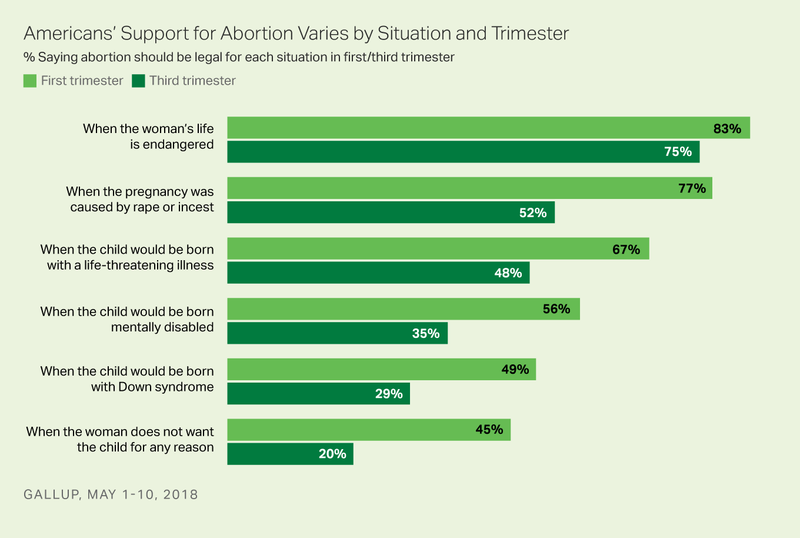 In the Gallup Poll, only 45% of U.S. adults believe first trimester abortions should be legal for social reasons. Even though the Gallup poll found 60% of Americans saying abortion should be generally legal in the 1st trimester, 55% of Americans would ban more than 92% of abortions, if given the opportunity. Roe v. Wade says late-term abortions can be banned, but any ban has to have a “health” exception. Doe v. Bolton defined “health” as any reason, even economic reasons. You can have a late-term abortion in America for any reason, because any reason has a “health” exception according to the U.S. Supreme Court. Planned Parenthood opposes laws that ban abortions on children diagnosed with Down syndrome, even though a minority of Americans believe they should be legal. Planned Parenthood often uses children with disabilities to justify keeping third-trimester abortions legal for any reason. They say these disabilities aren’t diagnosed until later in pregnancy, and somehow that means a woman should be able to get an abortion for any reason up to the moment of birth. Only 29% of Americans think abortion should be legal for Down syndrome in the third trimester. As many as 87% of Americans oppose the practical outcome of Roe v. Wade! Only 13% support legal abortions in the 3rd trimester. How can Gallup claim Roe v. Wade aligns almost perfectly with American’s views on abortion? Well, even Gallup doesn’t understand Roe v. Wade. Have they heard of Doe v. Bolton? If two-thirds is a super-majority, a massive majority of Americans oppose Roe v. Wade. It’s time for educators and journalists to stop running interference for the abortion industry and confusing even their own colleagues about the status of abortion law in America.